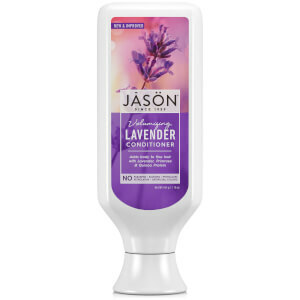 Treat your hair to the naturally body-building properties of JĀSÖN® Volumizing Lavender Conditioner. Adding bounce and body to limp, lifeless locks, the conditioner delivers maximum volume without dryness. Its dose of Wheat Protein Amino Acids provide all-day volume, whilst natural extracts of Lavender and Evening Primrose weightlessly strengthen. Fortifying fine hair, the volumising conditioner will enhance body and shine. It also contains Jojoba Seed Oil to help restore moisture, softness, manageability. After shampooing, apply conditioner to hair from root to tip, paying special attention to the ends. Rinse. For best results, shampoo with JASÖN® Volumizing Lavender Shampoo.